The ECOMI Collect project is backed by ORBIS Blockchain Technologies Limited, a New Zealand based company established in 2017 and the owner of the Secure Wallet brand/IP along with its associated manufacturing facility. Ecomi Technology PTE Ltd, the vehicle for the token sale and ongoing development/management of the ECOMI Collect project, is a registered entity in Singapore. 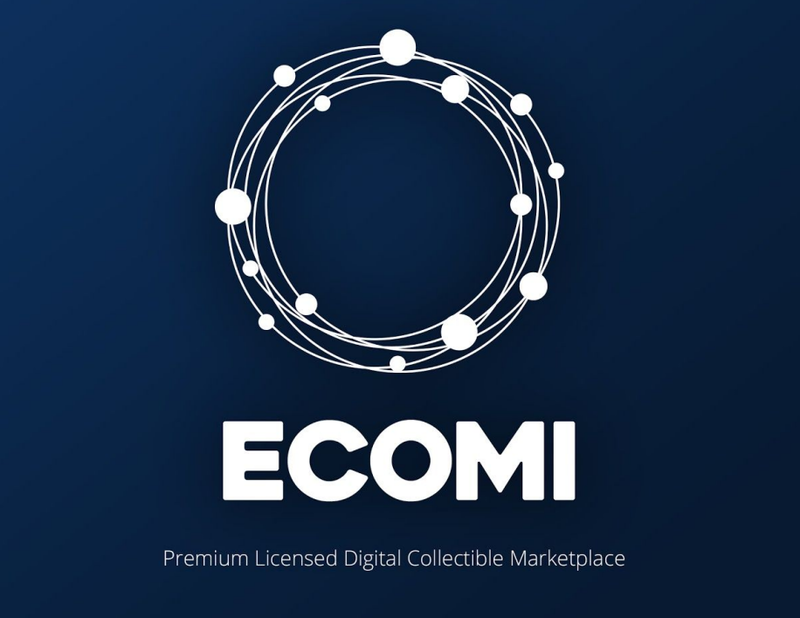 ECOMI Collect is a “premium licensed digital collection marketplace”, a dApp, built on GoChain with the primary functionality of leveraging NFT tokens for the issuance and management of digital collectables/assets, on which users, via the use of blockchain technology, can peer to peer buy, sell and trade licensed digital collectables using fiat converted into GO-20 OMI tokens and GO-721 NFT’s. For a full overview of non-fungible tokens and how they will be implemented on the blockchain, please see the article below. In the blockchain space, ECOMI Collect shares a niche with EPIK token and WAX, among others, in the sense of using NFT’s to create and exchange digital assets. Unlike WAX or EPIK, the ECOMI Collect ecosystem is closed, meaning items that exist within ECOMI Collect stay inside and cannot be transferred out. In the traditional space, ECOMI Collect is looking to tap into the existing digital goods market, stated by the ECOMI team to be worth $80 billion in 2017 and projected to grow to by $20 billion in the next 3 years. These digital goods marketplaces are primarily contained within the gaming ecosystem, with Valve and CS:GO creating a $2.3 billion dollar economy based off in games skins alone and FIFA Ultimate Team, in which gamers purchase virtual player cards to build their squads, accounting for a majority of Electronic Arts value in 2018, being just a few recent examples. There are three main components that make up the ECOMI Collect ecosystem, the App, the content licenses/digital collectables accessible via ECOMI Collect and the Secure Wallet. ECOMI Collect is a free to download dApp developed on iOS, Android and PC that houses all of the main features and functionality the drive the ECOMI Collect platform. 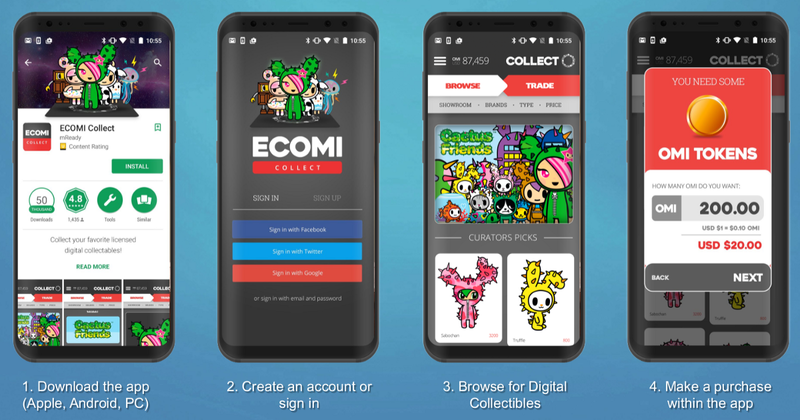 ECOMI Collect will offer a primary collectables marketplace in which digital collectables can be purchased directly from the application itself. 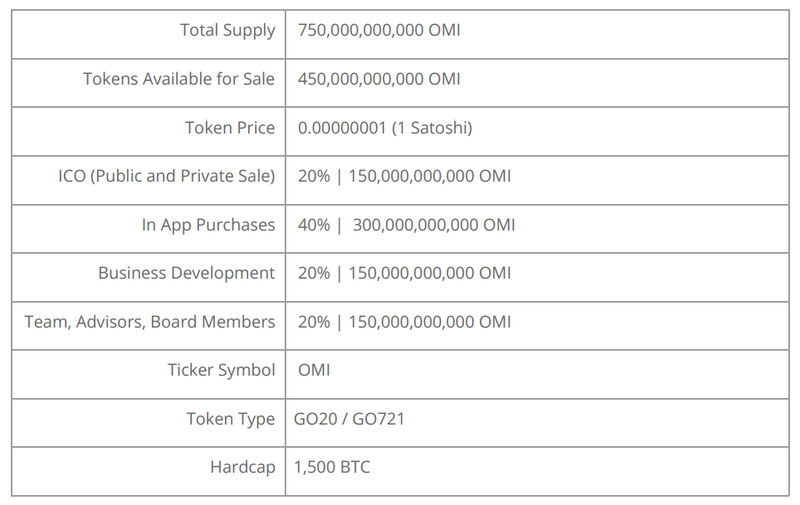 Users will be able to purchase these digital items in fiat, with purchases being automatically converted into OMI tokens via the In App Purchases liquidity pool (discussed in more detail below). Digital collectables in the ECOMI Collect ecosystem come in five levels of supply categories, Common, Uncommon, Rare, Ultra Rare and Secret Rare, with varying degrees of supply, with Common being 62% of the overall individual collectable supply and Secret Rare being 1%. Based off the availability of a digital collectable, once purchased by a user, it will have it’s supply reduced and the ‘edition’ purchased removed from the total editions available when sold. Collectables within the primary marketplace will be offered exclusively via ECOMI Collect and are organised via brands, types and categories. Prices are displayed in both fiat and OMI, with the fiat to OMI peg being set using the trading price of the OMI token on crypto exchanges. The application will also host a secondary collectables marketplace, Essentially this is the eBay of digital collectables issued on the ECOMI Collect network in which participants can buy, sell or trade digital collectables and items purchased via the primary marketplace between themselves. Unlike the primary marketplace, in which the price for an item is set directly by ECOMI Collect, in the secondary marketplace, the seller/owner of a collectable can either set a “buy it now” price or sell the item via auction. A fee of 2.5% per overall value of each transaction will be charged to the seller for use of the secondary marketplace, with the fee being payable in OMI tokens. Use of the secondary marketplace helps contribute to the users overall “Master Collector” ranking. The ECOMI Collect Showroom is a customisable space in which a user can display their favourite digital collectables, be it privately or publicly. Users can change the layout and background of the showroom and can like and comment on other users showrooms. Showrooms can also be shared on social media. The ECOMI Collect Scene Creator, as the name suggests, allows users to create their own scenes via the use of a inbuilt 3D visual editor. This allows a user to place content such as digital collectables, virtual goods and background images to create their custom scene. Once created the scene can then be exported out to the users social wall. 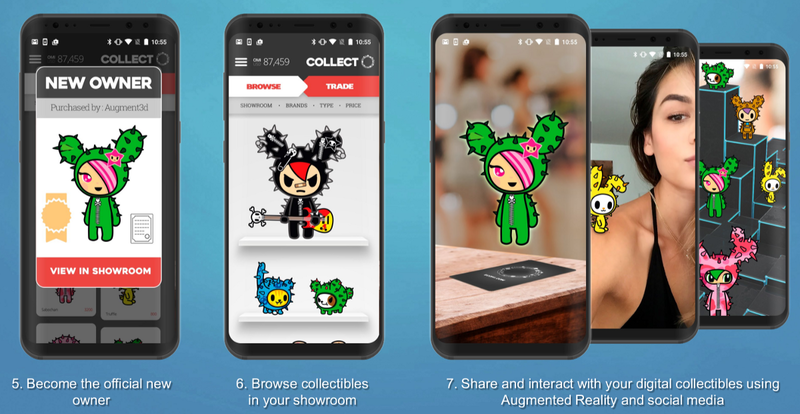 An extension of the showroom, the ECOMI Collect Social Wall is another method in which users can share their digital collectibles, scenes created in the Scene Creator or items they are selling on the secondary marketplace. The Social Wall displays personalised content based off the user’s specified tastes and interests. Users can choose to follow other ECOMI Collect users and will see this content any time that user shares something new. Think of this as the ECOMI Collect version of the Facebook Wall. Virtual Goods are defined as “any digital asset that is not a digital collectible” within the ECOMI Collect ecosystem and are essentially an additional value offering that allows a user to place such goods within scenes created in the Scene Creators to extend the interactivity and “stickiness” of the application. Initially virtual goods will provided by ECOMI Collect and its licensed partners, as both free and paid options, with the eventual plan to allow user generated virtual goods to be added to the ecosystem. Virtual Goods, like digital collectables, will also be created as NFT’s. By staking tokens as part of the Master Collector Program, users can gain early access to digital collectables releases, limited edition collectables and other, as yet unreleased benefits and features. Staking is facilitated via the “Powerchest” contained with the ECOMI Collect app. Master Collectors will receive ongoing OMI token rewards in a similar fashion to rewards given on PoS/Masternode platforms (though the specifics of such rewards have not yet been released). Each user starts at a base Maser Collector level of one and can increase this level by either purchasing and staking more OMI tokens (or grinding their way to higher levels for free via in-app activity). A minimum OMI stake is required to qualify as a Master Collector however the exact amount of tokens required has not yet been revealed. What really ties all the above aspects together, gamifies the platform and allows for the level of interactivity that closes the gap for the user between physical and digital is the use of Augmented Reality (AR) technology. This allows the user to view the digital object in 3D in the real world as demonstrated in the video above. While digital content in the modern world can often stand alone, as seen with games such as Fortnite, that while free to play, managed to generate over $3 billion in profit, predominantly from in-app downloads of digital content, there is a growing demand and usage of AR to extend digital content into the physical world, as witnessed with the explosive Pokémon Go fad of 2016/17, which allowed users to catch and interact with Pokémons, via AR, in real world locations. “Owning a Street Fighter digital collectible will grant access to play a multiplayer Street Fighter AR game, which can be played against other ECOMI Collect users who also own Street Fighter digital collectibles”. User will also be able to earn OMI tokens as they play these games, adding to the stickiness of the application, while also leveling up their Master Collector rankings. While the technology and platform listed above is impressive, the true driver for usage and adoption comes from the demand for the digital collectables/licensed goods themselves, and the ability the cross promote the existence of these goods via their existing content channels. The tech and platform simply facilitate this. ECOMI Collect state part of their adoption strategy is an aggressive cross marketing campaign with licensors that includes, global press release, cross promotion on social media channels, promotion on partner websites, promotion in retail outlets and retail partnerships, location based promotions along with physical and digital product crossovers, in which users gain the ownership of a digital collectable on ECOMI Collect by buying a physical item. Ideally this scenario would extend to the ECOMI Collect dApp being promoted as part of a licensed TV show with an already captive audience, allowing for the free download of both the dApp and a digital collectable. As with any platform, the hardest challenge is attracting and signing up users, so being able to tap into the multiple user bases of 15+ existing brands is a huge growth hack for ECOMI Collect. Leading the go-to-market (GTM) strategy for ECOMI is Alfred Kahn (see the team section for more details), considered one of the worlds leading experts in licencing and GTM strategy, responsible for bringing such brands as Pokémon, Cabbage Patch Kids, Teenage Mutant Ninja Turtles among others, to the world. Many consider Alfred’s greatest success story to be finding “Pocket Monsters” in Japan, buying the international licencing rights from Nintendo and renaming it to “Pokémon”, creating the mega brand we all know today. While Pokémon was sold back to Nintendo, Alfred has remained heavily involved in the GTM strategy for many other Nintendo brands, including their most recent success “Pokémon Go”. It is for these reasons we have placed so much emphasis on this aspect of the project throughout this article and feel this is the main strength of ECOMI Collect, one that without the licensing agreements and relationships ECOMI have in place, would be difficult for competitors to emulate. This is discussed in more detail in the Team and Partnerships sections below. The ECOMI Collect Wallet is a further connection between the physical and digital worlds for ECOMI and pairs to the ECOMI Collect dApp using an encrypted Bluetooth connection. The ECOMI Collect Wallet is based off the existing ECOMI Secure Wallet, which can also be used for the storage of OMI tokens and NFT’s while also supporting other cryptocurrencies, BTC, ETH, LTC, BCH, XRP (via the ECOMI App, separate to the ECOMI Collect App). 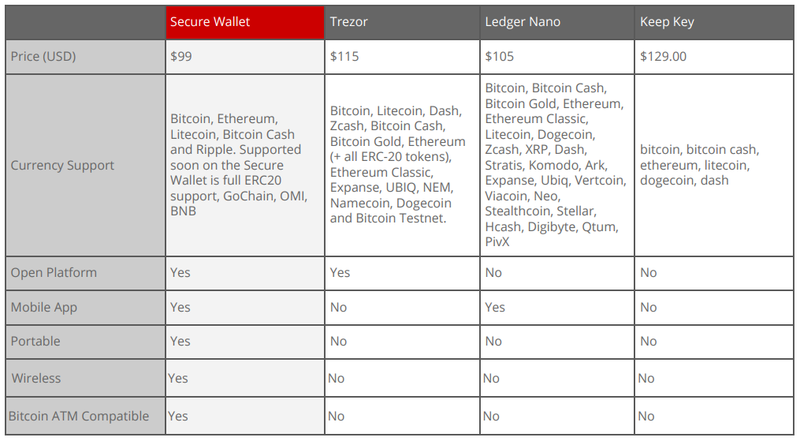 In this sense the Secure Wallet competes as a standalone product to Ledger and Trezor. The ECOMI Secure Wallet will have full ERC20 and GO20 token support in Q1 2019. Like its competitors, the Secure Wallet is a cold storage wallet and manages the users private keys on their behalf, with a recovery seed phrase being generated at the point of setup, allowing the user to restore their tokens to another Secure Wallet in the event of a lost wallet or hardware malfunction. As per Ledger Nano and Trezor, the Secure Wallet comes with a partner application, available on Android via Google Play and on iOS via the Apple App Store which allows the user to pair the wallet to the application and use the application directly to send and receive cryptocurrencies. Both the Secure Wallet and the ECOMI App are already live and functional. The ECOMI Collect Wallet is not just a rebrand of the ECOMI Secure Wallet, instead offering different functions and features. This includes a bigger screen and two buttons instead of one, which allow the wallet to act as 2FA device for the dApp with private keys being hosted on behalf of the user by ECOMI and not on the actual wallet itself (as per the Secure Wallet). In this sense, once a user performs an action on the dApp that requires confirmation, the Collect Wallet will display this on the E-Paper display and the user will need to use the interaction button to action any in app changes. The ECOMI Collect wallet also has modified internal tech, allowing for a reduced $29 price tag as compared to the $99 Secure Wallet. It is important to note that use of the Collect/Secure Wallets are not required to buy/sell/trade digital collectables on ECOMI Collect, as the dApp has a self contained wallet, generated upon account creation, within the app itself. To help with adoption of both the application and wallet, ECOMI Collect will offer a retail pack that will be distributed and sold at 4000+ retail channels ECOMI Collect has existing relationships with, for a RRP of $29.99 USD. The retail pack includes a limited edition ECOMI Collect Wallet, a limited digital collectable to get the user started, along with the other various wallet accessories, charger, charging cable and instruction booklet. The ECOMI Collect ecosystem consists of two distinct tokens, GO-20 OMI tokens and GO-721 OMI NFT tokens. GO-20 OMI are the transactionary currency of the ECOMI Collect ecosystem, while GO-721 OMI tokens are non fungible tokens that represent the digital asset and immutable proof of ownership for the user. NFT’s in the ECOMI Collect ecosystem also include meta data of detailed attributes, such as the collectible name, licensor, brand, series and links to the NFT’s various digital assets (such as clothing, props, etc). Obviously the main utility function of the GO-20 and GO-721 OMI tokens is for the purchase and sale of digital collectables within the ECOMI Collect ecosystem. Purchases are made in fiat (via credit or debit card) which is then generated into OMI tokens at market price, deducted from the In App Purchases liquidity pool. In the secondary marketplace, sellers fees are also deducted from the users account in OMI tokens. As covered above, to qualify as a Master Collector a user must stake a minimum amount of OMI tokens to participate in the program. As per usual, staking has the benefit of locking tokens from the overall circulating supply, putting upward pressure on the token price. At this point in time it is unclear as to the amount of tokens required to stake at the various collector levels and the specific benefits each level brings. As mentioned previously, when a user purchases a digital collectable via the ECOMI Collect app this is done entirely in fiat (via credit or debit card), in order to reduce any friction points for the general consumer/mass market, however each fiat purchase is automatically converted to OMI tokens at the time of purchase, using the fiat to OMI peg of the current price of the OMI token on crypto exchanges. Once a user has purchased a digital collectable via fiat and this is converted into OMI, the GO-20 OMI is then traded for the digital collectables GO-721 NFT token. The NFT is then added to the users secure wallet and the OMI tokens used to purchase the NFT will be sent to a non accessible locked contract, effectively burning them, as they can no longer be accessed by any party. This has the obvious effect of reducing the overall token supply. ECOMI Collect have also stated they will institute a OMI token buy back scheme from day one, based off revenue from NFT sales, which will place further demand and buy pressure on the OMI token. The use of GO-721 NFT tokens is perhaps the most compelling token utility use case when it comes to digital assets and the blockchain. With the whole idea of digital collectables, and indeed, collectables in general, being based around legitimacy and scarcity, NFT’s offer verifiable digital scarcity that rival, and in some aspects surpass, the verification levels that exist with physical collectable items, i.e a NFT cannot be faked while a physical item can and NFT’s also include additional metadata of the object, such as previous owner and other associated data that offer immutable proof of an items existence and history. The ECOMI Collect project has a hardcap of 1500 BTC and is currently in the private sale stage. In total 750 billion tokens will be minted with 20% (150 billion) of these being sold during the course of the private and public sales. Both public and private token allocations are unlocked immediately after issuance. The public sale will be held via an Initial Exchange Offering (IEO) and contributions will be accepted in BTC only. 20% of tokens sold is on the very low end of the spectrum for a token sale. Based off a BTC price of $4000, at 1500 BTC, this gives the project a 6 million USD hardcap, which itself is more than acceptable, and the company an overall marketcap/valuation of 30 million USD. 40% of tokens, or 300 billion, will be designated for In App Purchases. This is essentially a liquidity pool as when a user purchases a digital collectable from the ECOMI Collect application, their fiat (via credit or debit card) will seamlessly converted from fiat to OMI tokens are deducted directly from this pool of tokens. Past the initial money raised during the public and private sales, this liquidity pool will be used for the ongoing development/funding of the project. Again, based off a BTC price of $4000, this gives the liquidity pool an initial value of 12 million USD, more than enough to fund the project for quite some time once the private/public ICO funds are exhausted. 20% of tokens, 150 billion, will be allocated to the long term business development fund. These tokens will also be unlocked immediately after issuance. This will be used as required for additional content licencing, partnerships and a reserve fund. The team states these tokens will be left untouched until funding from other sources, public/private sale and revenue from the In App Purchases Liquidity pool, are exhausted. Depending on the burn rate for the company, this should hopefully lock these tokens from the overall circulating supply for at least a year. The final 20% of tokens will be allocated to the Advisiors/Board Members and ECOMI Collect Team/Founders. The Advisiors/Board Members tokens are locked for 12 months and then fully unlocked at that point, while the Team/Founders tokens are locked for 24 months and vested at 25% quarterly, resulting in a full unlock of all tokens after 3 years. These are acceptable lock periods for each set of tokens. Based off a full issuance of tokens from the public and private sales, this will result in 80% of the tokens essentially being in play, however with 40% of these being dedicated to the In App Purchases liquidity pool, and 20% to the long term business development fund, this will keep these tokens off the open market, resulting in an approximate circulating supply of 20% or 150 billion tokens on initial release (which could be lower if the private/public sale isn’t capped out). Unsold tokens from the private/public sale will not be burnt and instead will be added to the In App Purchases liquidity pool. What is most interesting about the ECOMI Collect token metrics is the initial token price of one satoshi. Due to the team not allowing any other trading pairs past BTC, and with plans to blacklist exchanges known to list tokens without project permission from listing with alternative trading pairs like ETH, on which the token could be traded at a lower price than one satoshi, this means that initial floor of the token price is already set. With pricing on exchanges operating in increments of single satoshi’s, this means its quite easy to do the maths on any potential upside price movement and how it relates to returns for investors or token holders. This is a unique approach to a token price and listing, and to the best of our knowledge not something that has been attempted previously. In a year in which many projects are down 90%+ from initial ICO prices, this mechanism will help protect token sale investors from similar lows. Of course, this is entirely reliant on the team execution in regards to listing/blacklisting unwanted exchanges and alternative pairings to BTC. While the company behind ECOMI Collect, ORBIS Blockchain Technologies Limited, has been in existence since 2017, ECOMI Collect, via Ecomi Technology PTE Ltd, was only established in early 2018. During 2018, the project has undergone several strategic changes, mostly in regards to the structure of the token sale, which can be attributed to the addition of Benn Godenzi to the team as the lead ICO Strategy advisor. As such, despite having been in existence for some time, the current roadmap starts in Q4 2018 with the release of the current version of the whitepaper and the securing of the initial brands that will issue digital collectabes on ECOMI Collect. The beta version of the ECOMI Collect dApp will be released in Q1 2019. This will be an actual dApp, not a centralised MVP, built on GoChain. This version will not contain any digital collectables that will make it through to the initial release of the production application. Q2 2019 marks the v1 release of the ECOMI Collect dApp and the first wave of digital collectables, with the ability for users to purchase digital collectables in fiat, via the In App Purchases liquidity pool. 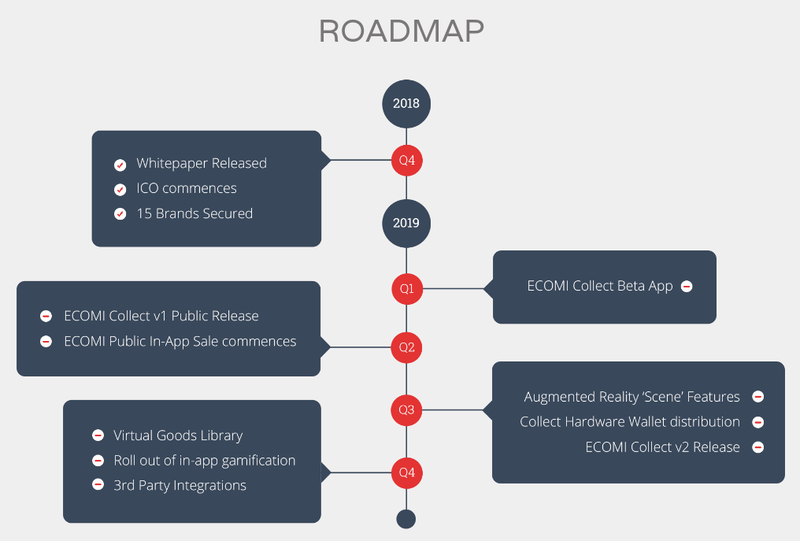 ECOMI Collect v2 will be released in Q3 2019 and introduces AR to the application. The Secure Wallet Retail Pack will also be released via retail channels at this time. Virtual goods will be introduced in Q4 2019, along with 3rd party integrations (the assumption being this allows other parties to access the ECOMI Collect dApp/ecosystem via the use of SDK/API). As per the modern token sale world of 2018/19, a shorter roadmap with achievable tech goals is favoured over a long term road map with loftier goals and slow delivery of tech. With the blockchain aspect of the project being focused around the facilitation of transactions via tokens and the use of NFT’s to issue immutable digital collectables and is assisted by the partnership with GoChain, a majority of the development time will be spent building what is essentially a traditional mobile application, something that is entirely achievable within the proposed time frames. What is most critical to the ECOMI Collect roadmap and adoption of the platform in the “real world” is the addition of licensed content that drives demand. Past the initial 15 secured brands, the ECOMI Collect team have stated a further 20 such deals are in the works, with these deals being 90% complete. As such, the announcement of these deals, along with the brand names associated with them, should greatly strengthen the roadmap and rollout plan. The ECOMI Collect core team is 12 members strong, with a 5 man executive team and 14 (count ’em) advisors. In total 31 team members make up the project. More details on David Yu can be found in the articles below. More details on Alfred Kahn can be found in the article below. More details on Joseph Janik can be found in the article below. More details on Mikel Duffy can be found in the article below. The ECOMI Collect team also boasts several advisors of note, from both the crypto and content licensing/gaming worlds. The ECOMI Collect team ticks a lot of boxes in regards to the necessary experience in the various niches required to deliver a product that exists in the content, gaming, AR and blockchain spaces. David Yu’s exposure to retail channels in the gaming and collectable worlds will allow for easy distribution of the physical version of the product while the tech team have previously delivered the partner app for the Secure Wallet, so there is enough confidence there that they’ll be able to deliver the ECOMI Collect dApp, especially with the support of GoChain. However it is the addition of Alfred Kahn that is the jewel in the crown of the ECOMI Collect project and its ability to bridge the gap between the traditional/physical and digital world of collectables. While the blockchain use of ECOMI Collect via NFT’s is compelling, the main driver of adoption and usage for the project stems from the ability of the platform to offer licensed content from content providers and brands that foster demand for the digital collectables/items. 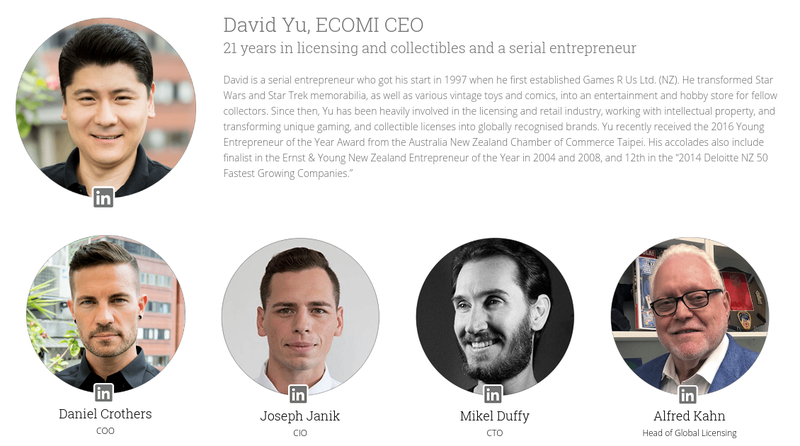 Known as “the man behind Pokémon” with Alfred’s connections into the world of content licensing, this should help deliver the premium licensing agreements ECOMI Collect will need to gain a foothold and adoption in the space. ECOMI Collect has a number of partnerships that include both the blockchain and content licensing industries. The ECOMI Collect partnership with GoChain allows for use of the GoChain platform for both the IEO and ECOMI Collect application. This seems to be a pragmatic decision based off the trials and tribulations of the CryptoKitties application, which brought the Ethereum network to a screeching halt when in full hype cycle. Of course the fact Benn “GoChain” Godenzi is also an advisor to the project also would of had some bearing on the matter. Using GoChain over Ethereum has several benefits. Both networks (as GoChain is a fork of Ethereum) support the NFT token standard, which is critical to a project looking to issue immutable assets. GoChain has the added benefits of handling 1300 TPS (apparently scaling up to 13 000 TPS in Q2 2019) compared with Ethereum’s 13 TPS, while also being 7500x cheaper to transact on than Ethereum. More details on the specifics of the ECOMI/GoChain partnership can be found in the article below. CraneKahn is Alfred Kahn’s licensing company and currently owns the content licensing IP for Kung Foo Pork Choppers (which has 7 billion annual views in China), Mofy, Wonder Balls and WordWorld. As mentioned in the team section, the addition of Alfred and thus this partnership with CraneKahn, is one of the core value propositions of ECOMI Collect, as licensing agreements and thus licensed content, and the promotion of this licensed content via networks such as Alfred’s/CraneKahn’s. CraneKahn! - Entertainment. Brand Licensing. Toy Development. ECOMI Collect has already secured 15 major content licensing partnerships with leading television, video game and “lifestyle” brands. For the purposes of this article we have been requested not to name the exact brands, however we have been given a preview as to who these brands are and can confirm they are indeed “premium” and if utilised with the correct marketing strategy in the real world (i.e promotion of the dApp, tie in of digital collectables to TV shows/video games etc), should be a huge driver of adoption to the platform. Obviously these partnerships are crucial in delivering the vision of ECOMI Collect. Without the blockchain, and a scalable one at that, paired with NFT’s, ECOMI Collect would just be another basic marketplace in which users can purchase generic, easily replicable digital goods, many of which already exist today. In the same sense, without premium licensed content that users are actually interested in, along with the ability to promote it, there would be next to no demand for use of the application, regardless of its use of blockchain. As discussed in the first of our The Case for Actual Adoption in Crypto articles, dApps need to provide the usability and accessibility of centralised apps, while offering the benefits of the blockchain or token ecosystems, and not the other way around. Too often dApps come from the wrong angle, a poorer version of an existing application offering no other value past “blockchain”. A killer dApp should be a good app first with the decentralised/blockchain component providing the cherry on top. In that respect, ECOMI Collect are not exactly reinventing the wheel with what they’re trying to achieve…and this is an entirely good thing! Instead, they are putting a new spin on an existing business model, transitioning it from the physical world to the digital world, via the use of blockchain technology…technology that only enhances the project, not restricts it, as seen with many other blockchain conversions of existing business models. With an addressable current day digital goods market of over $80 billion that is only set to grow (projected to increase by $20 billion in the next three years) gaining a foothold and market lead in the space will only ensure further adoption and access to content/IP as the digital goods market matures. Via the use of strong IP and licenses, gamification and aggressive cross promotion of the app via partner channels, along with a genuine use of blockchain technology leveraging NFTs, ECOMI Collect has strong potential for adoption in the real world, something critical of any project looking to raise funds or launch in 2019. Due to the the request of the ECOMI Collect team to not name any of the content licensing agreements in place, we have reserved rating the project on our blockchain project review sheet until such time as this information is public, due to the impact these agreements will have on the project. Please note, the thoughts and opinions in this article are those of the writer and in no way should be considered financial advice. Wolf Crypto is a place for ETH & BTC TA, ICO discussion, altcoin roulette & memes. Wolf Crypto is not only a place for ETH & BTC TA, ICO pools, altcoin roulette & memes. Our main activity is the management & promotion of ICO’s.